The fact is, most of us aren’t born with a red carpet smile. And that’s where Dr. John Delplanche and our team at Raleigh Hills Orthodontics can help. Of course, orthodontic treatment help make your teeth stay strong, healthy and become perfectly-aligned. But did you know you can get the beautiful straight teeth you’ve always wanted — without braces? We are proud to offer a clear alternative option for straightening teeth called Invisalign, which uses a series of invisible, removable and comfortable aligners that no one can tell you’re wearing. Today, we thought we would answer some of the most common questions we hear about Invisalign! 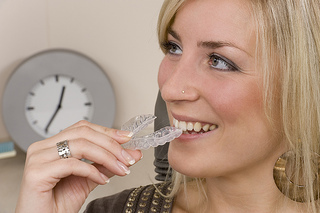 Q: How is Invisalign treatment different than traditional braces? A: Not only does Invisalign effectively straighten teeth, Invisalign aligners are comfortable and durable, and provide patients the opportunity to enjoy their favorite activities such as sports and playing instruments, activities that can be challenging while wearing braces. Also, Invisalign’s near-invisibility is a popular feature; treatment is very inconspicuous, making it easier to fit in rather than call attention to treatment. And because Invisalign aligners are removable, patients can take remove them at meal times, as well as to properly brush and floss to maintain healthy hygiene during treatment. Finally, Invisalign treatment has fewer emergenies because there are no wires or brackets to break or stick the patients. A: Using a series nof clear, removable aligners to gradually straighten teeth, we use proprietary 3D computer imaging technology to map the complete treatment—from start to finish. When the aligners are placed on the teeth, they cause your teeth to gradually shift from their current position. After approximately two weeks, you will begin using the next set of aligners, which will continue the teeth straightening process, ultimately giving you the smile you’ve always wanted. Q: Is Invisalign as effective as regular braces? A: Yes. Depending on the case Invisalign maybe more effective than braces but in certain cases braces may be the optimal appliance. We recommend that you get a consultation with Raleigh Hills Orthodontics to see if your case will be best treated with Invisalign. A: The length of treatment depends on the severity of each case and can only be determined by a visit to Raleigh Hills Orthodontics during a consultation with Dr. John Delplanche. We hope this helps! If you are interested in learning more about Invisalign, please give us a call at our Beaverton, OR office to schedule your initial consultation.